If you could make your own healthy bread in five minutes a day would you do it? Could you find the time for such an enterprise? "Healthy Bread in Five Minutes A Day", by Jeff Hertzberg, MD and Zoe Francois, is your guide to doing what would seem like the impossible. This photo is of bread that my husband, Matt, baked himself. Doesn't it look amazing (and it tastes great, too)? It was made entirely with whole wheat flour. Recently, I met Jeff Hertzberg, MD at a FoodBuzz conference. He handed me a copy of his book (I love free books) and I was inspired to try his method. How do you do it? You make a starter mix for many loaves of bread in a big container, let it rise, and just leave it until you want to bake. Then you pull out a pound of dough, let it rise, and bake it. We have found that for the second rise we can leave it all day and it turns out great. So, just form a loaf when you get up, leave it until you get home from work, and bake it when you are making dinner. Why would you want to make your own bread? The most obvious answer is it tastes SO much better than anything you can buy, unless you live in a great bread town (like San Francisco). And, you can make it healthier than any packaged bread from the supermarket. The big nutrition problem with bread is that the processing of the flour removes the nutrients. Wheat is a grain from a grass that is full of nutrients. But, after milling it and bleaching it, the nutrients get taken out of the grain. That is why white bread is really a form of junk food. The millers add back vitamins, but white bread is a REALLY processed food. 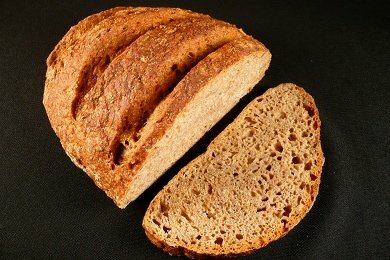 Whole wheat bread is made with flour that contains more of the nutrients that get removed after milling. There is protein, iron, fiber and fat in wheat, which makes it nutritious. So, eating whole wheat bread is a healthy snack. The supermarket is filled with whole wheat breads, but it sometimes difficult to tell which are the healthiest. Bread manufacturers add things like high fructose corn syrup and lots of salt to make the bread taste good. When you make your own bread, you can add seeds and nuts to amp up the healthiness. Basically, you are adding more protein, more fat, and more fiber and more deliciousness. "Healthy Bread in Five Minutes a Day", has a bunch of great recipes for healthy bread. Here is the link to the book on Amazon. There is an instructional video posted here that is a great introduction to the whole concept. Want to read about more baked snacks? I love this idea. And I always think of baking bread as a long process. I may have to check this book out to see how to make a starter mix. Thanks! Can you convince the author of the book to share one recipe with your email list? It seems like a great idea, but I was dissapointed to learn that this intro was just a promo to sell the book. I think this is a great idea! I'm also interesting in reading one of the recipes when you share it! They have a website at http://www.artisanbreadinfive.com/ that has lots of recipes and tips. I've been using their original Artisan Bread in Five Minutes a Day recipe for a couple of years now, and absolutely love it. We even use it for stuff other than bread loaves -- pizza dough, pita, and even naan! Funny thing, my hubby keeps telling me about his mom making him fresh bread daily. (they lived on a farm and everything he ate was fresh) maybe I can live up to her now with the Bread in Five. Thank you for the great idea and website direction. Love your ideas. I appreciate that you've respected our copyright. We can't give permission for anyone to violate the copyright-- publisher would kill us, even though people are violating it all over the Internet. In theory, publisher can and will go after them with cease and desist letters. Best bet is to refer readers to our website, where there are lots of full recipes, at www.breadinfive.com. Or of course, the books. It's a pain, and a balancing act, because the Web is a terrific marketing tool and people who post about us (like you) are our lifeblood. I bought this book and have made the bread once and it turned out great. Now that fall is here it's time for more bread baking.